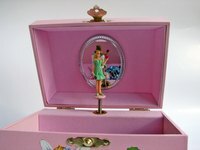 Music boxes produce a tone that sounds like no other instrument. By learning how to grind your own music box comb, you can make the heart of a music box. Combs come in a variety of sizes and ranges of notes. A simple one octave diatonic comb can produce a wide range of tunes and chords. Cut the first tooth on your steel plate. This tooth is the highest tone in your scale. Score a line 10 mm perpendicular from the bottom edge of the steel plate at 1 mm from the left edge. Put on your goggles. Cut along this line with the angle grinder. Tune the tooth. Put the steel plate in the clamp. Make sure the tooth you have cut is not caught in the jaws of the clamp. Turn on the electronic tuner and hold it close to the clamp. Pluck the tooth and observe the note produced by the comb. You want a C. Using the angle grinder, cut the tooth a little longer. Use the tuner and repeat cutting and testing the note until the tooth produces a C.
Cut the next tooth. Measure and score a line 1 mm from the edge of the plate next to the first tooth. Cut along this line to a depth equal to the first tooth. Repeat Step 2 to tune the tooth to B.
Repeat Step 3, tuning each subsequent tooth to A, G, F, E, D and C (one octave lower than the first tooth). You should now have eight teeth on your comb. Cut off any spare metal plate to the right of the final tooth. You can use this technique to produce any key you like by choosing a different note at the start. A chromatic comb can be made by including the sharp notes A#, G#, F#, D# and C#. This will give you a 13-note comb. Cutting with an angle grinder can be dangerous. Use an appropriate spark shield and goggles at all times. Cut outside or in an appropriate workshop.